Tom Mackee wants oblivion. Wants to forget parents who leave and friends he used to care about and a string of one-night stands, and favourite uncles being blown to smithereens on their way to work on the other side of the world. Review - When you open the cover of a Melina Marchetta novel you have certain expectations. If you're a newbie, you expect to be blown away. If you've read her work before, you expect character depth, memorable dialogue and an intriguing family full of skeletons, battened down resentments and fierce love. The Piper's Son will meet both criteria with aplomb. Arguably The Piper's Son is Melina Marchetta's most adult work. Some may even argue that it doesn't fall within the parameters of what might be considered young adult literature. It spotlights on two members of the Finch-Mackee family - Tom and Georgie (his aunt). Already wisened Marchetta readers will be familiar with one half of the equation having read Saving Francesca, though this does not mean you need read this book knowing the events of the previous one. Tom's still delightfully chaotic but in the five years since we've left him, he’s travelled an increasingly darkened path. Georgie is new to the fold but provides a welcomed voice of reason and perspective on Tom’s life and those of her family. Their perspectives alternate throughout, shedding light on how Tom and Georgie hit rock bottom after their beloved Joe is killed. While this event quickens their descent into self imposed isolation, it wasn't the initial cause. Georgie is in the midst of a dysfunctional and uncommunicative relationship , while Tom's father's alcoholism and resultant family breakdown has weighed on him. Marchetta's introduce both characters at their lowest ebb and yet it is not a depressing journey. The Piper's Son is a darker themed book but it never feels overwhelming. Instead it makes the lighter moments feel earned. Marchetta has lovingly crafted the Finch-Mackee family in all their flawed, bawdy brilliance. They are loud, emotional, demonstrative people, unfortunately not when they need to be. The legacy of the first Tom, the cursed Tom, and the tragic death of Joe, casts a shadow over all of them, seeping into the cracks and splitting them apart. There is an overwhelming sense of family history that permeates this tale. Each character is delivered to the reader as a complex, broken individual. There's three generations of stories, slights, fights and silence that influence everything. They are loyal to one another, even in silence. It is what is not said that holds importance for the majority of the book...something true for most families. Addiction, pride, anger, regret and oblivion are all strong elements of Tom and Georgie's family story. They have addictive personalities-whether people or substances, they hold tight. They don't do anything by halves; even self-destructive behaviour is a gold medal event. Loss, grief and forgiveness filter through strongly, without ever being a clanging anvil. Whereas the emotional push really derives itself from the internal machinations of the Finch-Mackee family, some comes from Tom's attempts to right him life outside of his family. This throws him back into the friendship fire that is Francesca, Justine, Tara, Will and the rest of the gang. No one has had a particularly easy road since high school and yet this group of people feel the same despite their growth. The text messaging and emails alone will have you chortling as the spirited interchanges and random jokes. Marchetta has woven a beautiful somewhat saddened tale about loss, hope, family and the realisation that your parents have never been perfect (in fact they might even be more screwed up than you are.) The world is textured and real, the characters nuanced and the plot involving. 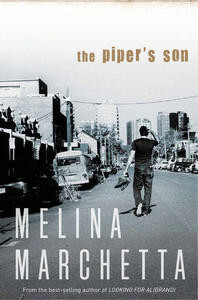 The Piper's Son is a welcomed addition to the Melina Marchetta library. It will weave its way into your thoughts with the eccentricities and scars of these wonderful people. My interview with Melina about this book will be posted in the next few days. It's a thought provoking and informative glimpse into the book, its characters and her current projects. The Piper's Son is available in stores today. An American release date has not been announced so assume it will be in 2011/2012. Those who are not Australian might think about online ordering it from these stores. Book Depository should have it in stock very soon as they have the title up. I've left you an award! I just bought the novel today and spent every spare moment I had reading it. About ten pages before the end, I started procrastinating my reading because I wanted to hold onto the characters for a bit longer. I loved Saving Francesca and sequels are usually a tricky land to navigate but I really enjoyed what Melina Marchetta has done with The Piper's Son. I've fallen out of my old obsessive reading habits but Melina Marchetta's writing always sparks that crazed reader part of me. I'm looking forward to your interview with her and I hope she mentiosn the soundtrack a bit more because I would love to know which songs she chose for the book. I almost jumped around in glee when I realised she had a Stars' lyric in the book from Your Ex-Lover is Dead. I loved what she did with Francesca and Will--actually, what she did with the group from Saving Francesca. I loved that they had moved on and changed but that they were still bound by the events of that year. One thing, though...I don't think Sam did enough grovelling. That relationship was very difficult for me to get my head around. Loved it, but I wished we could have seen a bit more of Jimmy... potential book material there, eh? How did I not know this was out. I must go and find it within the week. I enjoyed the review and am happy to know that the gang is in this book somewhere- I may me a old follower of marchetta but she always blows me away, so thinking this won't be the exception. I loved this book so much, maybe a bit less than Jellicoe (",) but Melina definitely didn't disappoint. Your review is so articulate, well written, and generally full of awesome; I completely agree with you. Also, I actually liked how different Frankie was compared to from Saving Francesca, and how she was still there but never dominated the story. The story was Tom's and Georgie's all the way. Love this review and am (arguably) as big a Marchetta fan as you are ;) Would you say this ends on a happy/hopeful note? I'm almost afraid of this one because so many people are describing it as being very heavy. HELP!!! Where can I by this book? I just didn't want this book to end! I agree with Ruby...I am hoping there might be another book about Jimmy. Hitting the bare-essentials list! :) Thanks for the review, can't wait to read this book.